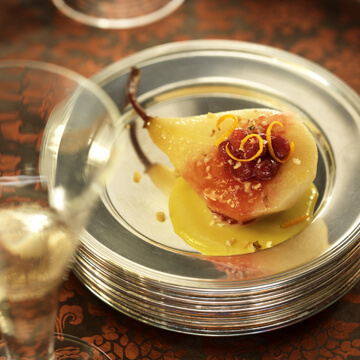 Whether you are a “stuffing” or a “dressing” kind of person, pears add a magical twist when served alongside your holiday bird. Because they are sautéed and then baked, the pears are meant to be meltingly soft in this side dish, and any variety will do. Sausage adds a piquant kick, and don’t skimp on those fresh herbs. 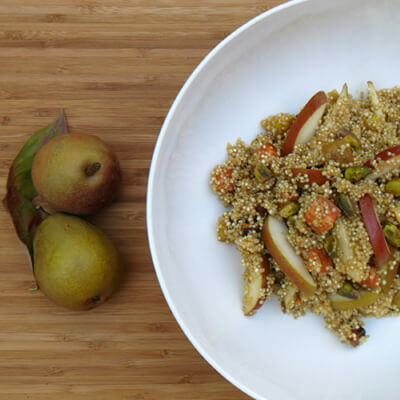 Consider this recipe another delicious vehicle for getting pears on your Thanksgiving table. Preheat the oven to 375°F. Grease a 3-quart casserole dish with butter. Spread the bread cubes on a large rimmed baking sheet and toast them in the oven until lightly browned, 12 to 20 minutes (depending on the moisture content of the bread). Combine the toasted bread cubes, parsley, and sage in a large bowl; set aside. Meanwhile, melt the butter in a 12-inch skillet over medium heat. Add the onion and celery and cook until soft and translucent and beginning to brown, about 15 minutes. Add the sausage and cook until browned, breaking it up with a wooden spoon, about 5 minutes. Add the pears and continue cooking until they are just soft, 3 to 5 minutes. Pour in the stock, add the pepper, and bring it to a simmer. Pour the contents of the pan over the bread cubes and toss until evenly moistened. Taste and add salt as needed. Loosely pack the dressing into the prepared dish and cook, uncovered, until the top forms a deep crust, 25 to 30 minutes. Serve hot.